CORE DESCRIBERS : 3 teams, 3 specialties, 1 goal ! EPISODE 2 : STRUCTURAL GEOL. Q: What kinds of degrees do most of the members of this expedition have? How did you end up working on this project? 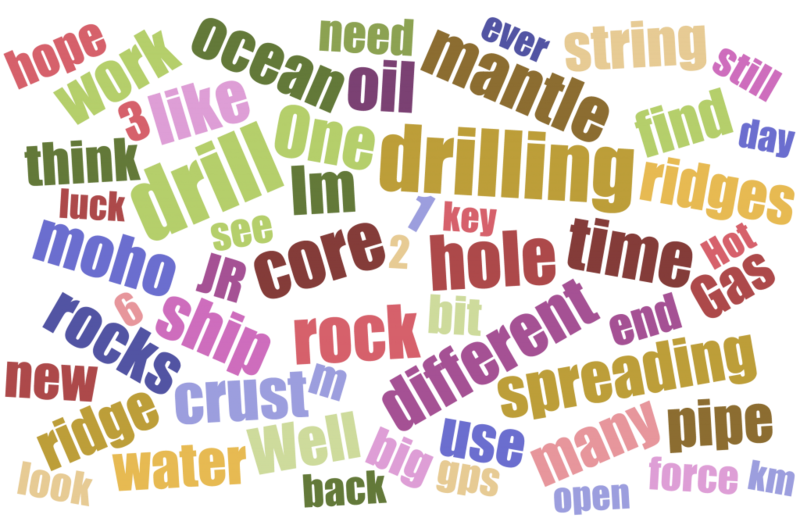 And what advice would you have for budding geologists who might like to pursue a similar career? A: Most everyone in the science party have PhDs but some are graduate students, they don’t take graduate students who are not registered for a PhD. Many of the technicians have bachelors or masters degrees. Scientists applied to their national IODP organization and were selected based upon the needs of the expeditions and nationality. General advice for a budding geologist: go into the field at every opportunity and ask your prof to work in their lab, don’t be afraid to take on new challenges! Q: Forgive my ignorance of Iceland and Hawaiian geology, but are there no gabbro‘s that might be able to be drilled from land there? A: There are a few gabbros exposed in Iceland but the conditions under which they formed are not similar enough to the ocean crust to be of direct use to our study. There are gabbros formed at spreading ridges called ophiolites but they are not exactly the same. We can only test models derived from these by drilling the real thing. Q: Looking back, what kind of preparation do you feel was critical to the success of this expedition? Were there any gaps in preparation identified by any of the crew members after departing from Colombo? A: The most important part of the planning was finding exactly where to drill to answer the questions of our principal hypothesis. This required many years of study and previous expeditions (at least 20 years of work). So far so good, no major gaps! Special thanks to co-chief Chris MacLeod, microbiologist Jason Sylvan, paleomagnetists Julie Bowles and Tony Morris, publications officer Alyssa Stephens, marine computer specialists Steve Thomas, as well as education and outreach officers Marion Burgio and Alejandra Martinez. Very special thanks to camp boss Kevin Lucas for making up such delicious snacks to keep us going!